The fan belt is in good condition but the blower motor and blower (or air handler) are not. A leaky float and overflowing pan in the humidifier above the blower motor, are the cause for all this rust. Fan belts and humidifiers should be checked annually to prevent this from happening. Direct-drive furnace motors have by-and-large eliminated the use of fan belts. There is no need for a barometric damper in high efficiency and some models of mid efficiency furnaces. Mid efficiency or non-condensing furnaces. Condensing or high efficiency furnaces. barometric damper. Service plans. Mid efficiency or non-condensing furnaces feature an important combustion chamber of ceramic fibre or stainless steel which extract more heat from the circulating house air. It uses 20 to 23% less oil than a conventional furnace producing the same amount of heat. Condensing or high efficiency furnaces use an extra heat exchanger made of stainless steel to extract more heat from the combustion gases before they leave the furnace. Soot marks. It is recommended that you check your oil fired equipment between tune-ups. - If you hear a 'boom' during burner ignition. - If smoke puffs out the inspection port. - If soot appears around the inspection port. - If you smell oily smoke. - If you see soot around registers, barometric damper,duct joints or chimney connection. The presence of soot could mean a defective heat exchanger, restricted combustion air or inadequate cold air returns. The barometric damper is located in the flue pipe of standard (older) furnaces. The flue pipe is the section of pipe between the furnace and the chimney. 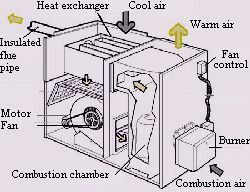 The damper is a balanced device that is closed when the furnace is off and swings open when the furnace is on. The barometric damper maintains the correct draft pressure for the burner. Adjustments, if necessary, are part of the annual tune-up. Furnace tune-ups. The most important factor in keeping an oil furnace operating at peak efficiency is an annual cleaning and burner tune-up which could take up to two hours. Fan belt. The fan belt should be adjusted if the slack is more than 1/2" (13 mm). If the smaller pulley is much warmer than the large one, tighten the belt. If the belt is too loose, less air will be moved and energy wasted. Cracked, frayed or worn belts should be replaced at once to ensure uninterrupted service. Service plans. There are several service plans available that may be beneficial to you. Contact your oil supply or heating contractor and discuss your options.